A comprehensive fully resourced lesson. Students begin with a 'what's behind the squares?' starter which gets them to think about the brutality of the regime prior to the May 4th Movement. The class then work through a detailed set of notes before taking on the challenge of creating a rap-style confrontation between Chiang Kai-Shek and Mao (to help with this there are modelled responses and a crib sheet of key information on both). If students prefer they can of course also replace the rap with letter writing. 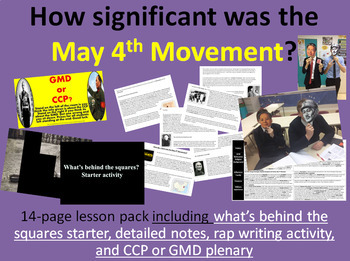 The lesson concludes with a quick formative assessment which tests students subject knowledge acquired in the lesson in which they decide if a piece of information relates to the GMD or the CCP. I love this lesson because it makes tracking student progress very clear. I hope you enjoy it.